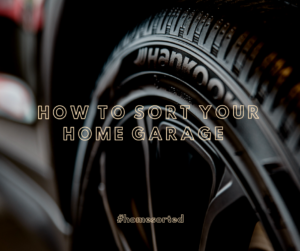 How to Sort Your Home Garage - Home Sorted! Is your home garage in need of some serious organisation? We talk a lot about getting your home sorted, but what about tips to sort your home garage? If you haven’t been paying attention to your home garage, chances are you’re going to have a lot of clutter. We recommend dedicating a few solid hours to sorting through your home garage and removing items that you no longer use or need. The same applies to items that are damaged or are missing parts and cannot be fixed. Excess items can be taken to the tip, donated to family and friends or charity if they’re still in a functional condition. You can also use this as a chance to sweep and clean the home garage floor – a tough but rewarding job! Next up is figuring out how you’re going to organise your space. We love creating zones for the home garage as it allows you to group like items together. Potential zones include tools, gardening equipment, car items, sporting equipment and so on and so forth. Once you’ve figured out your zones, it’s time to consider the storage options you’re going to use. Vertical storage is always a good choice and it allows you to store more items in a smaller area – and takes advantage of wall space that would otherwise be left untouched! Doesn’t that sound like a fantastic idea? Effective vertical storage can include wall shelves or hooks to hang tools from. You can also create a sporting equipment zone where you hang bikes from a wall rack and store other miscellaneous sporting equipment in buckets together. If you’re the DIY type we’re pretty certain you’re going to have a workbench in your home garage. Utilise this space by attaching a pegboard above the workbench for extra storage. Pegboard are a fantastic way to sort tools. You can organise them by type and size. It’s also super useful for checking that each item has been put away after it’s been used. A simple glance along the wall will tell you if something is missing. You can also attach small containers to the pegboard to sort and store nuts and bolts. Are you ready to use some of these tips for your home garage?